Check out our insights into the world of media and marketing, along with project spotlights, featured blogs from our client pages and other musings on how to optimize brand recognition in today’s technologically-driven environment. Long lines, stampeding shoppers and huge hauls are a few common associations with the Friday after Thanksgiving—the busiest shopping day of the year for retailers, otherwise known as Black Friday. Though leaving the house at midnight to be among the first to steal some holiday deals can be exciting, so is staying in your pajamas with a cup of coffee and scoring sales from the comfort of your own couch—made possible by a phenomenon called Cyber Monday. Curious to know more about the internet’s sales holiday? 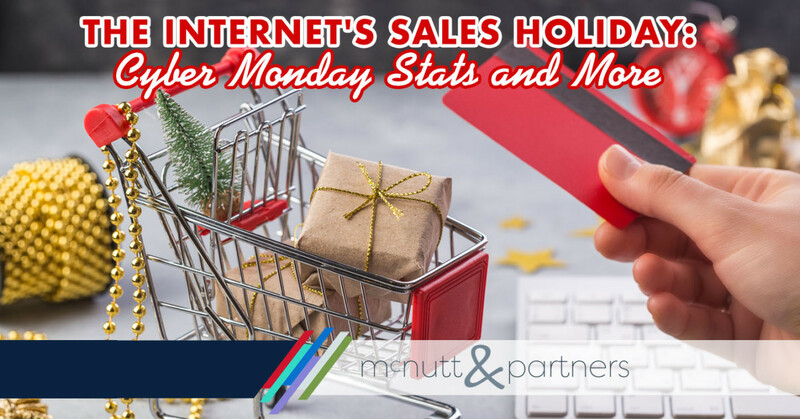 Check out these Cyber Monday stats and facts. Now more than a decade old, Cyber Monday was created in response to Black Friday as online shopping became a staple for the holiday season. The National Retail Federation (NRF) coined the term Cyber Monday in 2005 as online sales in the days (and specifically Monday) after Thanksgiving were increasing exponentially. According to the NRF, online retailers were wanting in on the action that brick-and-mortar stores attracted via Black Friday; thus, Cyber Monday was born. 2005: The National Retail Federation sends out its initial press release announcing Cyber Monday. 2007: The Great Recession hits, but Cyber Monday prevails, continuing upward sales from 2007 ($730 million) to 2008 ($836 million). 2008: Amazon becomes the No. 1 retail site for Cyber Monday, beating out Walmart. 2010: Major retailers like Toys “R” Us, Sears and Kmart extend Cyber Monday to “Cyber Week,” offering deals throughout the week after Thanksgiving. 2010: Cyber Monday spending hits $1 billion for the first time. 2013-2015: Site-wide discounts become popular, as retailers like Target, Old Navy, ASOS and more offer anywhere from 15 to 50 percent off site-wide. 2017: Cyber Monday sales hit $6.59 billion with that number poised to increase in 2018. Cyber Monday sales have grown from $484 million in 2005 to a record $6.59 billion in 2017 (Forbes)—making it the largest online shopping day in U.S. history to date. Mobile sales on Cyber Monday 2017 hit $2 billion in a 24-hour period for the first time (CNBC). Mobile Cyber Monday shopping set a new record in 2017, representing 4 percent of visits and 33.1 percent of revenue (Forbes). Eighty-one million people shopped Cyber Monday sales in 2017 (NRF). Last year, 71 percent of people said they planned to shop on Cyber Monday, compared to 69 percent who said they planned to shop on Black Friday (com). In the 18 to 34-year-old consumer group, as 88 percent planned to shop on Cyber Monday compared to 74 percent of 35 to 54-year-olds in 2017 (com). The most popular item to shop for on Cyber Monday? Clothes, as 22 percent of consumer seek deals for clothing (com). Despite clothes being the most sought-after for deals, TVs represented the biggest average discount of 21.1 percent (Forbes). Surprise, surprise. Amazon is the most popular Cyber Monday retailer, having captured 60 percent of Cyber Monday sales in 2017 (com). So, what can we expect for Cyber Monday 2018? Despite the heightened craze around online shopping, based on its annual survey, the National Retail Federation predicts that a lower number of people will shop during Cyber Monday this year—only 75 million compared to last year’s 81 million. The reason? Younger consumers, considered those under the age of 35, were more focused on the social and family traditional aspect of shopping in-store on the days prior to Cyber Monday. Time will tell what this year’s Cyber Monday stats will reveal. In the meantime, happy shopping! McNutt & Partners is a full-service advertising and digital marketing agency. Contact us today for your marketing needs! Call 334-521-1010, or visit our contact page. Welcome to Thanksgiving week! In anticipation of the holiday and all that surrounds it, you may be experiencing a slew of emotions. Hunger for a plate filled with turkey, cranberry sauce and broccoli-cheese casserole. Elation for days off of work and school. Excitement for late-night Black Friday shopping. Dread for seeing those relatives who—well, you know the ones. Another feeling that we should all be expressing now, if not year round, is gratitude for the good things in our lives. 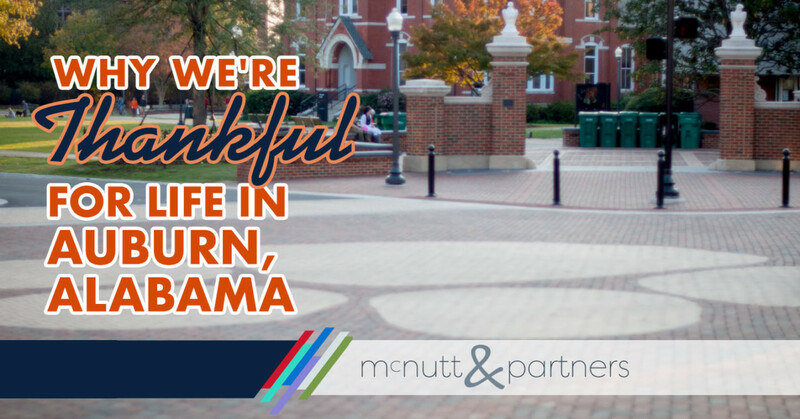 Though at McNutt & Partners our clients and employees are pretty spread out geographically, our home base is Auburn, Alabama. With this city as our central hub, here are a few reasons why we’re thankful for life in Auburn, Alabama. Connectivity. Though Auburn itself may not be a bustling metropolitan mecca (and those of us who live here are glad it’s not), we’re close to a few major urban environments. Atlanta is less than two hours by car (and the airport is even closer), Birmingham is a two-hour drive, and our state’s capital, Montgomery, is a quick hour down Interstate 85. Auburn is also within arm’s reach of Columbus, Georgia, the Gulf Coast—and destinations like Savannah and Charleston on the east coast are within a day’s doable driving distance. A thriving business climate. We would know—we’re lucky to be part of it! When doing business in Auburn, you’re never alone, as the support of other entrepreneurs, local enterprises and our chambers of commerce is tangible. And it’s a business community that continues to grow. Continued investment into the area. A fitting segue from above, we’re thankful for life in Auburn, Alabama, also due to the ongoing attention the area receives from others looking to invest in the community. It’s evidenced by construction going on in all corners of the town and Auburn University campus, which will ultimately paint Auburn as a worthy candidate for further advancement. A research community. Research is a driving force here in Auburn, and we’re lucky to be surrounded by it on a daily basis at our location in the Auburn Research Park. From initiatives to turn garbage into energy to leading global security corporations that continue to innovate, there’s an abundance of research activity going on under our roof—not to mention at Auburn University. Auburn University. It’s really what makes all of the above possible. Founded in 1856 as the East Alabama Male College, the award-winning Auburn University now enrolls nearly 30,000 undergraduate, graduate and professional students representing 140 majors among 15 colleges. It also employs more than 5,000 full-time employees, making it the largest employer in the Auburn-Opelika Metropolitan area. Not to mention, we love our Auburn Tigers sports teams, who, on a good day, lead us downtown to Toomer’s Corner with rolls of toilet paper in hand. Local tradition. Toilet paper–cue traditions! Not every community is fortunate enough to be rooted in tradition as deeply as Auburn, and we mean roots in a literal sense. Rolling the Toomer’s Oaks after a Tigers victory never gets old for us. Neither does Toomer’s lemonade, the flying of the eagles at home games, tailgating on Samford lawn—the list goes on. The Auburn Family. Yes, it’s a real thing. You’ve seen those commercials where someone is on an African safari and sees another person wearing an Auburn ball cap, and they exchange a “Hey, War Eagle!” It’s the idea that no matter where you are in the world, you have an understanding with a fellow member of the Auburn Family—and family always has your back. In addition to being thankful for where we live, work and play, we’re also thankful for the wonderful people and businesses we have the opportunity to work with on a daily basis. Happy Thanksgiving! 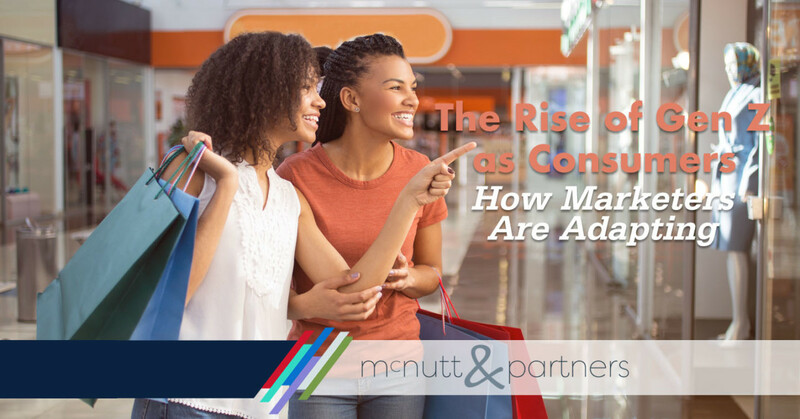 Though you may still be rifling through your leftover Halloween candy, the consumer world is in full swing in anticipation of winter holidays on the way. Thanksgiving, Hanukkah, Christmas, Kwanzaa, New Year’s—it’s all happening in the span of the next eight weeks, and as a marketer, it’s time to formulate your plan of attack. The holiday season is prime time for capturing new leads, and instilling brand confidence in existing ones. 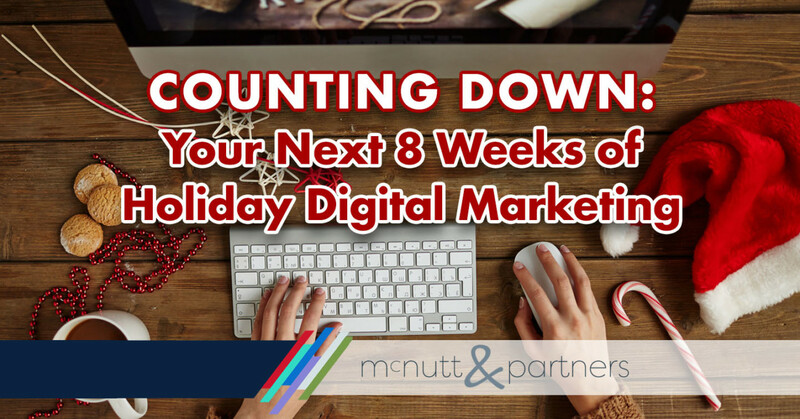 Here’s an outline for your next eight weeks of holiday digital marketing. Week 1 (Nov. 12): If you haven’t already, it’s time to start talking about the holiday season in your messaging. If you’re one of those people who thinks Christmas music is off limits until after Thanksgiving, that’s fine; however, don’t ignore it in your marketing plan! It’s the last full week before Thanksgiving, so find a way to make concepts like Thanksgiving prep, travel, family gatherings and even Thanksgiving week football connect to your brand messaging. Week 2 (Nov. 19): Turkey Day is three days away! Now’s the time to ramp up what you did in week one, as well as find ways for you as a brand nto express thanks and talk about what you are grateful for (i.e., your customers). Here are several ways you can thank your customers this Thanksgiving via various marketing mediums. Don’t forget to plan a Thanksgiving post for the big day. Thanksgiving isn’t the only excitement for the week, however. Depending on your brand, Black Friday may be your biggest day of the year. If you are having specials for the occasion, let customers know throughout the week what they can expect—and be sure to share any irregular hours that you will be open. Week 3 (Nov. 26): Ah, the post-Thanksgiving lull. Time to relax, right? No way! Thanksgiving comes early this year, so having a full week of November after the fact may lead you to dismiss December holidays until December 1. In reality, this extra week just means more opportunity for you to hone in on your holiday messaging. Start spelling out your December specials now so people can prepare. If specials don’t fit your brand, then you can still join the holiday festivities. Start a countdown to the holidays, or host giveaways using holiday trivia. And don’t forget Hanukah—it starts Dec. 2 and ends Dec. 10. Week 4 (Dec. 3): Now that you’ve flipped your calendars to December, the end of the year is in sight. Not only should you be full-on theming your messaging around the holidays, but also, think about any end-of-the-year promotions you may be running. If your product is of the gift-giving type, now’s a good time to remind people when the last day to order is for gifts to arrive in time. Also, if you haven’t decorated, now’s the time—and we don’t just mean in brick-and-mortar stores. Adjust your digital assets like your social media profile and cover photos to reflect the holiday season. Week 5 (Dec. 10): There are two weeks to go until Christmas Eve, so remind your followers that preparation time is precious. Whether you’re selling a product that could appear under the Christmas tree or you’re simply giving helpful advice, ideas for messaging could include offering tips for holiday shopping, gift wrapping and even travel. If you really want to go the extra mile, put together a gift guide to share on your social media accounts. Now’s also a good time to remind people that gift certificates to (Insert Your Business Name Here) make for excellent last-minute gifts. Week 6 (Dec. 17): The way the calendar falls this year, this will likely be the last full week most people are working before the Christmas holiday. That being said, if you’re a b2b brand, make sure you have everything you need from your clients to get you both through the in-between time. Oh yeah, and did we mention that there is one week left until Christmas?! That may not seem like much time, but it’s still plenty of opportunity to hit your followers with a helping of holiday digital marketing cheer. Schedule it out ahead of time so that you’re not having to work up until the last minute. For your Christmas Day posts, it’s OK to get a little more personal. Share some of your staff’s favorite Christmas traditions or memories, or simply express the way the day makes you feel. Your brand followers will appreciate learning more about the faces behind the brand, and what better time to do that than the holidays? Week 7 (Dec. 24): ‘Twas the night before Christmas, and all through the digital marketing realm…OK, we’ll stop there. But hopefully, if you took our advice of scheduling social posts and blogs ahead of time, now you can relax! As the week goes on, however, there’s new holiday digital marketing fodder to consume: Kwanzaa (starting Dec. 26) New Year’s Eve, and the concept of an impending new year in general. As 2018 comes to a close, it’s a time for reflection—meaning posts sharing your “Best Blogs of 2018” or “Best Memories of 2018” are appropriate. Week 8 (Dec. 31): That’s a wrap for 2018. Let your brand followers know what you as a business are looking forward to in the New Year! And don’t forget to plan a “Happy New Year” post at midnight. See, holiday digital marketing doesn’t have to be overwhelming! If you feel that way though, the McNutt & Partners team can help. Fill out our contact form to get in touch with us about your marketing needs today—before the chaos of the holidays ensues. We like to think of social media as a “free” form of advertising, and it is—to an extent. Recent changes to the way content is disseminated to social media users—specifically on Facebook—has made it more challenging for marketers and business pages to get their posts into the spotlight. 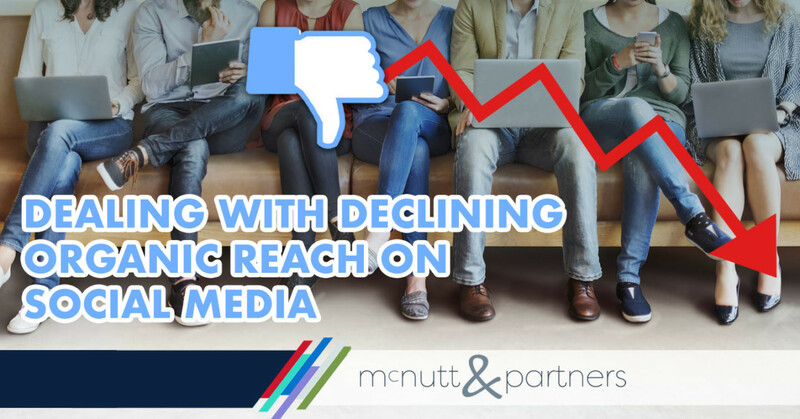 Declining organic reach on social media is not something to be taken lightly; fortunately, however, there are ways to combat this marketing disadvantage to still have your content seen by your intended audiences. You may have heard the term thrown around here and there, but what exactly does it mean? Organic reach is how well your posts perform without any paid support. Putting money behind your posts gets them seen by a larger audience, but organic reach is how far they extend without money—left to the whim of Facebook’s (or any social media platform’s) algorithm. 2007-2012: 16 percent of Facebook “fans,” (followers of “Fan Pages,” which launched in 2007) were seeing these Fan Page posts in their news feeds on average. 2014: That number drops to 6.5 percent. 2016: Facebook adjusts its News Feed algorithm again, and organic reach is lower than 2 percent in some cases. 2018: Facebook revamps its News Feed entirely following the Cambridge Analytica data misuse incident. Organic reach declines even further as Facebook strives to avoid exploitation of user privacy. So what content is being prioritized? That is shared via Facebook Messenger. That is liked or commented on. That receives multiple likes or comments. That promotes “meaningful interactions” between users (i.e., shares and comments). Paying to promote content. With organic reach now next to nil, paying to promote your social content is pretty much a must. Pay attention to the audience you are targeting with paid content. You can adjust factors like location, age, gender, interests and more, so make sure the audience you are appealing to is relevant. Posting more meaningful content less frequently. Rather than posting constantly to see what sticks, you’ll fare better to post quality content on a more limited basis. Again, think about your audience and what type of content will promote those meaningful interactions mentioned earlier in this post. Encouraging fans to adjust their notification settings. Fans of your page can actually tell Facebook, “I DO want to see this page’s content in my New Feed.” To do this, they can go to your page, click “Following” in the top navigation bar and select “See First” in their news feeds rather than “Default.” Fans can also go to the side navigation bar and click “Pages,” to see content from all pages they have liked. Video, video video. According to WordStream, social video generates 1,200 percent more shares than text and images combined. Videos have a higher engagement rate, which means good news for dealing with declining organic reach on social media. Experimenting with Stories. The “Stories” features on Facebook and Instagram allow you to bypass the algorithms that put you at a disadvantage. With stories, content is available to be seen for 24 hours from the time it was posted, making it ideal for more temporary, timely engagement. Customizing content for specific platforms. The same copy and graphics that get a stellar response on Instagram may not shine as brightly on Twitter, for example. Some platforms like loads of hashtags (Instagram), while others prefer quick, punchy copy (Twitter). Optimize your content for the social network to which you are posting. Declining organic reach on social media does not mean that businesses can no longer use social media as a marketing channel; it just means that the manner in which they go about it may have to be adjusted. 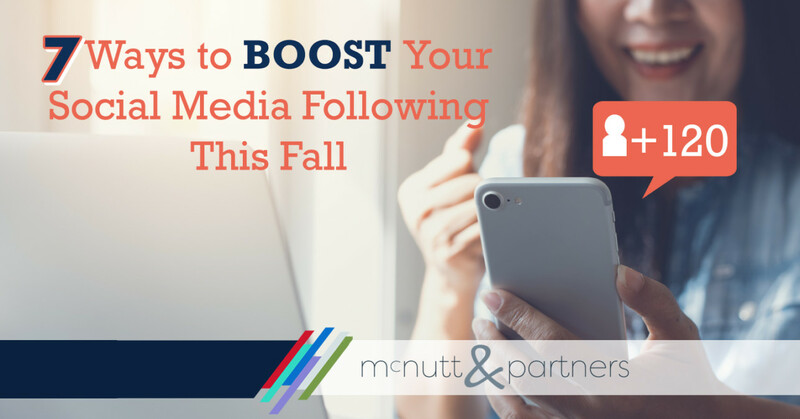 If you need help improving your reach on social media, the McNutt & Partners team can help. Call us today at 334-521-1010, or visit our contact page. It’s Halloween Eve Eve, and you know what that means! Well, all it really means is that you only have two days left to find a costume, get your candy stocked and plan out your horror movie marathon for the big night. But it also means that we’ve got spooks and scares on the brain, and in our world, there’s nothing scarier than falling behind when it comes to maintaining a strong and impressive digital presence. (I know, terrifying, right?) 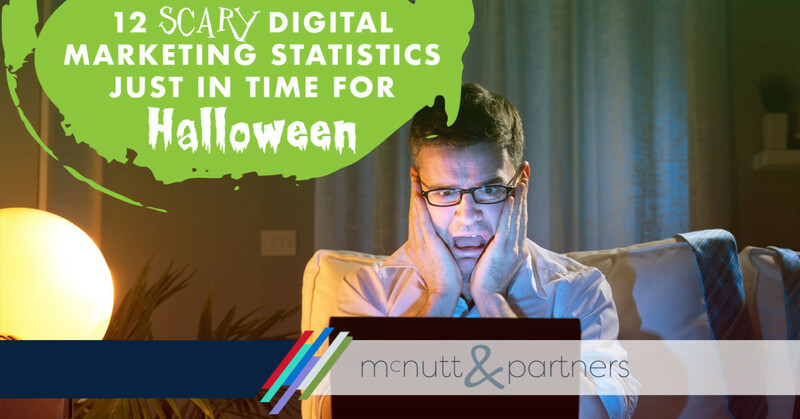 These scary digital marketing statistics show just how fast our world is changing, and just how behind some marketers are in its wake. Seventy-five (75) percent of people never scroll past the first page of search engines (Source: Junto). Why it’s scary: This statistic creates high stakes for SEO. If you haven’t optimized your website pages for keywords that you can feasibly rank for on the first page, then your chances of being clicked on in a search are slim to none. On average, companies respond to only 30 percent of social media users’ feedback (Source: Factbrowser). Why it’s scary: You wouldn’t ignore a customer who came into your store and asked a question, would you? Social media users are your customers and potential customers, and if they are reaching out to you on social media, you are only hurting yourself to not communicate back. The average conversion rate for websites using video is 4.8 percent, compared to 2.9 percent for websites that do not use video. (Source: Adelie Studios). Why it’s scary: If you’re not using video on your website, you are at a disadvantage compared to the competition who is. By 2020, 80 percent of the world’s internet traffic will be video. In the U.S., 85 percent will be video by 2020 (Source: Cisco). Why it’s scary: Well, it doesn’t have to be scary, as long as you’re poised and ready to fully embrace video in your marketing strategy. Otherwise, you may get left in the dust. Eighty-five (85) percent of mobile advertisers think they are providing a positive experience for users, but only 47 percent of users agree. (Source: Unlockd). Why it’s scary: This one’s pretty obvious. There is a pretty significant discrepancy between what mobile advertisers are doing, and what mobile users want. The average number of organic results appearing on Google searches has dropped from 10 to 8.5 (Source: Searchmetrics). Why it’s scary: Organic search results are dropping because marketers are spending more money on SEO, which means more competition. Bounce rates increase by 50 percent if your website takes two extra seconds to load (Source: Junto). Why it’s scary: Web users are impatient. There are literally millions of other places on the internet where they could be spending their time. Don’t fall victim to a slow site. Three million advertisers are using Facebook to reach their customers, which translates to about 93 percent of all total marketers (Source: IO). Why it’s scary: Competition, competition, competition. With 3 million competitors, it’s critical that you put in the effort to make your brand not only stand out, but stand out in a way that attracts and retains Facebook followers. Seventy eight (78) percent of consumers unsubscribed from emails because brands were sending too many in 2017 (Source: HubSpot). Why it’s scary: Email marketing can provide tremendous ROI for marketers, but there’s a fine line among what consumers will thrive on, tolerate and toss aside. Finding that balance is the difference between marketing success and distress. Emails that are not optimized for mobile devices get deleted by 80.3 percent of users, and 3 out of 10 unsubscribe from an email list when emails are not optimized for mobile (Source: Bluehornet). Why it’s scary: Haven’t thought about mobile design when creating your email blasts? Your messaging will likely end up in the trash. The majority of emails (56 percent) are now opened on mobile devices. Users view more than 500 million hours of video per day on YouTube (Source: Business Insider). YouTube is also the second-most visited website next to Google (Source: Alexa). Why it’s scary: For one, this statistic shows that if you aren’t using YouTube as part of your marketing strategy, perhaps you should be. If you are already employing it, use this as motivation to make sure your content is top-notch, as the field of potential followers is a vast one. Brands that use video as part of their marketing strategies grow their year-over-year revenue 49 percent faster than brands that don’t. (Source: Wirebuzz). Why it’s scary: Using video is a must for today’s marketers, as it offers proven paths to success. If you’re not using video as one of your marketing tools, you’re only hurting yourself. Hiding under the covers yet? If you’re worried about what these digital marketing statistics mean for your business, don’t be. There are actions you can take as a marketer to reverse the gloom and doom, and the McNutt & Partners team can help. Call us today at 334-521-1010, or visit our contact page. Everyone makes mistakes—and that’s OK! When treading water in the world of search engine optimization (SEO), it’s easy to drift in the wrong direction. After all, we only have control of our SEO results to a point—before the whim of Google wields its influence. There are actions you can take, however, to give Google a nudge in your favor. In an effort to better your search rankings, avoid these frequent SEO mistakes. Ignoring your site’s mobile version. When sitting down to tend to your website, you are likely doing so on a desktop; however, think about how many times you look at a website on your smart phone or tablet vs. your desktop computer. Your website visitors are no different. In fact, because so many people use the internet in mobile fashion, just this year Google switched to mobile-first indexing, which means it looks at the mobile version of your site first when considering your search ranking. You could have a great desktop version of your site, but if your mobile version is lacking, it’s likely hurting you in terms of SEO. Using too-broad keywords. Trying to rank for keywords that are too wide-sweeping is another among our frequent SEO mistakes. Here’s an example. If you’re a used car dealership, then you might think that you should try to rank for the keyword “used car dealership.” While this is not wrong, your efforts are better spent making your keyword more narrowed. In optimizing your site or page for “used car dealership,” you are competing with all of the used car dealerships across the world. Instead, try adding your location to the keyword so you will only be competing with other used car dealerships in your area, i.e. “used car dealership in Auburn, Alabama.” You will have a better chance of ranking that way. Not driving traffic to your site. So you’ve built a website, and it’s optimized for keywords—great! However, there’s another piece of the equation, and that involves inviting people to actually visit your website. One important way to make sure web users are finding your site is by making sure each of your site’s pages has an accurate and keyword-optimized meta description. The meta description is what will appear to search engine users—and what will let them know whether or not they should click on your site based on its content. Forgetting to populate your site with quality content. Your website layout may be stellar, but what about the content? Content is one of the most overlooked factors in terms of SEO. Length of copy, originality and readability are all variables that Google takes into consideration when determining your search ranking. However, ultimately you should focus on populating your site with engaging, relevant content that appeals to your site visitors. If you do that, then SEO should follow. Failing to incentivize people to stay. SEO success is not only about getting people to click on your site; it’s also about getting people to spend time there. The quality content we mentioned in the previous point can certainly help, but you should also incite action among your website visitors in an effort to have them click-through the site. Buttons like “Buy Now,” “Read More” and “Sign Up” are all options for encouraging web users to continue exploring your site. Limiting your presence to just your site. Having your site optimized to rank highly in search is one thing, but you should not limit yourself to your own website. The internet is a vast place, and the more reputable places your site appears, the higher Google is likely to rank you. Make it a point to create engaging content for other websites, and then have those sites link back to yours. Not claiming your Google My Business listing. Google My Business is a completely free way for your business to improve its SEO and to simultaneously make a positive first impression on potential customers by providing them helpful information about your brand. Google My Business is Google’s own tool, so it’s one that you should pay attention to in order to curry favor with the search engine. Read more about why Google My Business is critical to your SEO strategy and how to optimize your Google My Business listing. Overlooking the need for consistent SEO. After making an effort to avoid all of these frequent SEO mistakes, don’t forget this last one. Search engine optimization should not be a one-time thing. In fact, if you treat it as such, we can almost guarantee that you will not see the results you want. Continue creating and posting fresh content, connecting with other sites, choosing relevant keywords and driving traffic to your site throughout the course of your site’s lifetime, (which we hope will be a long and happy one!). Avoid these frequent SEO mistakes to set yourself up for a more successful search engine ranking situation. Need help? McNutt & Partners is a full-service advertising and digital marketing agency. Contact us today for your marketing needs! Call 334-521-1010, or visit our contact page. As much as we’d like to think that social media success isn’t all about the numbers, having a strong page following certainly does help. Instagram is one social network that is ideal for showcasing what is visually appealing about your product, brand or service. And being that social media users respond best to posts with less text and more visuals, Instagram can be a win-win social platform for your brand and its followers. 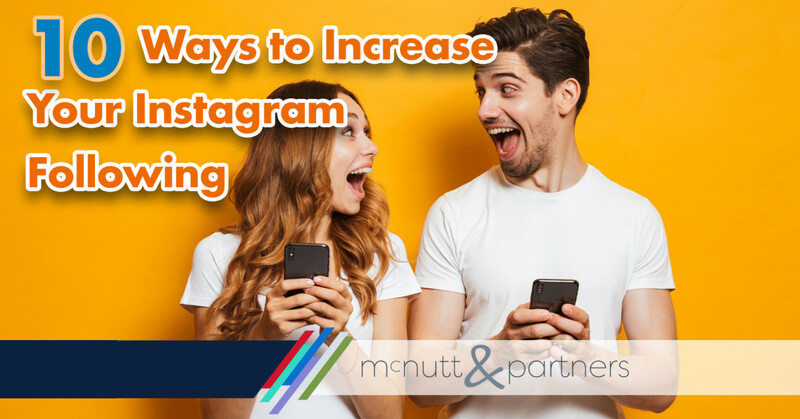 Whether you’re just starting out on Instagram—or you’ve found yourself sitting stagnant without any growth, try these ways to increase your Instagram following for an added boost. · Share high-quality photos. This is somewhat of a “duh” tip, but it’s an important one. Instagram is all about showcasing visual quality at its finest. When users are scrolling through their feeds, you want your photo to make them stop, pause and take some time to consider. Instagram filters are a quick and easy way to adjust the quality of your photos. Studies show that users gravitate more toward warmer-toned filters and ones that increase the contrast of images. · Post video. Instagram is not just for photos! Keep things interesting by also including video in the mix of your Insta content. Consider using Boomerang, an app created by Instagram that takes a burst of photos, speeds them up and then plays them forward and backward to create a looping video. Users also like to see faces. Have a representative of your brand talk for 10 to 20 seconds about a new product, offer or event happening at your business. · Caption your posts. While Instagram thrives on visual media, it is also important to put that media into context via captions. Let your brand’s personality shine through by using humor, asking questions, getting emotional—whatever feels appropriate for that post. Though there is no character limit on Instagram, sometimes less is more when it comes to coining an effective caption. · Post on a regular basis. Consistency is key across all social media platforms, and Instagram is no different. If you want to increase your Instagram following, make an effort to share content on a regular basis. This will give your brand followers a sense of trust in knowing that they can rely on your page to consistently post fresh content. It will also keep followers engaged and continuously provide opportunities for new followers to find your page. · Count your hashtags. Yes, literally count them. The guide we follow for our clients suggests that Instagram captions with 11 or more hashtags consistently yield the highest interactions. You can pepper hashtags within your captions, though we would suggest limiting it to two to three in-caption hashtags. Put the bulk of your hashtags at the end of the caption or even in the comments if you don’t want to distract from the message of the caption itself. Also, make sure to put thought into your hashtags. Don’t simply hashtag a word to add it to your hashtag count. Hashtags should be indicative of a movement, a trend or a keyword. · Tag other pages when possible. If your Instagram post warrants mentioning another Instagram page or user, then by all means, do it! To tag (called a “mention” on Instagram), type “@” and then the name of the Instagram page in your caption. Then the user or brand will receive a notification that he, she or it has been tagged. Make sure your mentions are relevant—i.e., if that person took the photo, or if you are working in collaboration with another brand and want to share that information in a post. · Identify your location. Instagram allows you to tag your location with every post, and doing so can help give your followers a sense of place and the ability to make a personal connection with your brand. On top of that, Instagram users can click a location and see all of the content associated with that location, so if your location is tagged, it provides just another opportunity for people to find your content. · Use contests to your advantage. A pretty effective way to increase your Instagram following is to host a contest on the platform. Ask users to “like” and “comment” on a post to be entered to win one of your products, a gift card to your store, etc. If you want to take it a step further (perhaps if it’s a valuable prize), you can ask participants to post a photo (of their Halloween costume, of their favorite food, of them with your product) with a specific hashtag to be entered to win. Requiring a simple “like” for an entry, however, is the most straightforward way to garner more page likes. · Engage with other accounts. If you want Instagram users to engage with you, you need to be willing to actively engage with other users as well. Like and comment on posts that you find interesting. It’s just another way to have your brand seen throughout the platform. · Pay to sponsor ads. Instagram offers several types of paid ads that can help increase your brand following. Photo ads, video ads, carousel ads and stories ads are all included in the types of paid advertising you can do on Instagram. Learn more about these types with Instagram’s advertising guide for businesses. And there you have it! Actively make an effort to increase your Instagram following, and find yourself one step closer to your marketing goals. Need help? 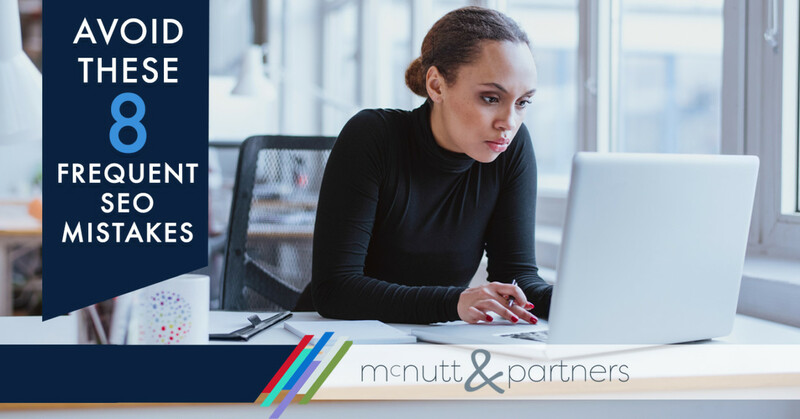 The McNutt & Partners team has your back. Call us at 334-521-1010, or visit our contact page. The tic-tac-toe-looking symbol that populates digital media today is one that the millennial generation and beyond once solely associated with a telephone. Eleven years ago, the same symbol that represents “pound” on a telephone opened up an entire new world of connectivity when it became the social media hashtag. Since then, hashtags have changed our culture in numerous ways. Hashtags didn’t just get their start on social media, however. In programming culture, the # symbol was referred to as the “hash,” rather than the pound sign. In 1988, the first hash symbol for grouping purposes appeared on Internet Relay Chat (IRC), where it was used to label common groups and topics. In August 2007, inspired by IRC, Chris Messina used the first hashtag on Twitter—and the rest was history. It did not catch on immediately, however. It took an event of nationwide importance—the 2007 California wildfires, for the hashtag to really catch on with #SanDiegoFire. So how does the hashtag affect our everyday lives? 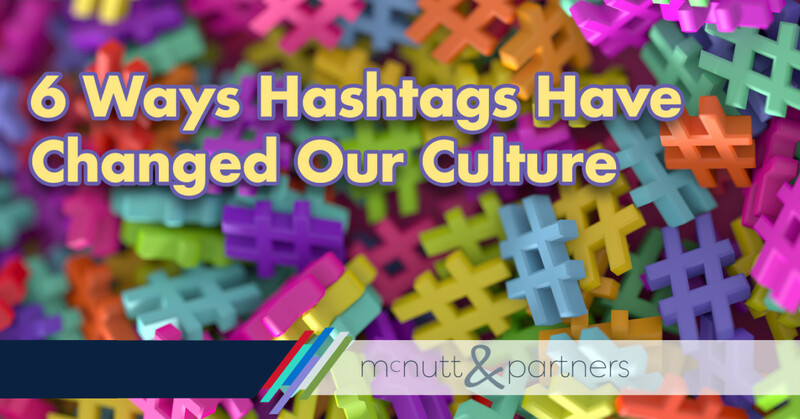 Here are a few ways that hashtags have changed our culture since their social media inception. News events proliferate more quickly. Such was the case with the first hashtag that really took off (#SanDiegoFire) and such is the case still today. Hashtags become especially helpful and relevant when a major news event is taking place. They allow social media users to follow one hashtag link to receive a plethora of similar information about said news event. No longer are we limited to hearing the news from anchors on TV. Hashtags essentially let the average person report and disseminate the news in real time. Cultural movements have a platform. One of the most current and prolific examples of this is the #MeToo movement, which serves to call attention to sexual abuse and give a voice to victims of it. Known as “hashtag activism,” using hashtags to inspire and spread societal change is another way that hashtags have changed our culture. Other instances of hashtag activism include #BlackLivesMatter, #TimesUp, #TakeAKnee, #OscarsSoWhite and so on. Hashtag holidays are a thing. Every day is a holiday with hashtags. There are hashtag holidays for virtually every topic, like #NationalTacoDay, #PositiveThinkingDay, #NationalRelaxationDay, #CheerUpTheLonelyDay—the list goes on and on, with full calendars available online outlining which hashtag holiday it is on any given date. Every day, there is essentially something to celebrate, something to raise awareness for or even some action to take, thanks to this cultural phenomenon. Social media users can see more of what they like. Much like following a person or a brand that they like, social media users can follow hashtags that they like. For example, if you follow “#atlfoodie” on Instagram, your feed will then show you posts, even from accounts you don’t follow, on which #atlfoodie was used—presumably, delicious food in Atlanta. Conversely, the hashtags you use on your social posts may show up on the feeds of users following those hashtags. This can be beneficial from a marketing standpoint. Wedding hashtags are a staple. Though they started out pretty simple (#SmithWedding), wedding hashtags have now inspired a need to get as creative as possible with puns, plays on words and alliteration (#SmittenForSmith). Consider #SayYesToTheKress, #MorganHeBargainedFor, #KellysCupOfJoe, etc. Not only do these provide a catchy, memorable association to serve as essentially the tagline of your wedding, but they allow you to easily locate one’s wedding-associated posts that others have posted on social media. This same concept goes for any type of local event: a fund raiser, a festival or even a family reunion. We (sometimes) say them out loud. This one’s just a spinoff of all of the above. Hashtags have become so ingrained in what we read and write on screen, that sometimes they even come out of our mouths. Think of it as a shortened version or summary of what you are thinking. For example, your friend tells you an uncomfortable story, and you reply: “Hashtag awkward,” rather than saying, “Wow, that’s a really awkward situation.” Those using hashtags in this sense are basically shortening their speech using the all-encompassing hashtag. The ways that hashtags have changed our culture over the past decade range from everyday speech to entire societal movements. Having had this much of an influence on the way we use social media already, time will only tell what’s in store for the future of the hashtag regarding social media. Need help crafting an effective hashtag? Click the link to learn more. Every human generation boasts its defining characteristics, molded by influential societal factors like technology, political opinions, work ethic, morals, social viewpoints—the list goes on. These inherent common qualities among members of a generation directly affect the way marketers attempt to appeal to the consumers of that respective generation. Generation Z, also known as “Gen Z,” is the latest generation poised to influence the consumer landscape, as it encompasses those born between 1996 and 2014. With the rise of Gen Z as consumers, marketers are having to adapt in order to make viable pitches that Gen Zers will grab hold of. Is the largest generation. Generation Z makes up approximately 24.3 percent of the U.S. population, according to 2016 U.S. Census estimates. That’s more than millennials (22.1 percent), Gen X (19 percent) and even baby boomers (22.9 percent). Though the majority of the Gen Z population is still younger than 18, the generation’s purchasing power is expected to reach $3 trillion by 2020. Heeding this fact is important for marketers looking to target the consumers who will soon dominate the market. Has always lived in the digital era. Gen Z has never lived without Internet, smartphones, tablets or even social media to a degree. Devices that were a luxury to previous generations are now standard. The fact that Gen Z has always been able to communicate essentially with the click of a button means that it is living in a smaller world than any previous generation. Gen Zers therefore value immediacy in their actions, driving marketers to think about how they can appeal to a generation that is not as easily impressed by technology as those that came before it. Grew up living cautiously. The majority of members of Generation Z grew up in a post-9/11 world—and one in which mass shootings continue to be more and more commonplace. This, combined with the fact that they have the ability to communicate in multiple ways from the comfort of their smart phones, means that Gen Zers are opting to just stay home. In fact, over the past 10 years, there has been a 38 percent decrease in the frequency with which 10th graders leave their homes without a parent to hang out with friends and a 19 percent decrease in the number of teens who get their driver’s licenses, according to Adweek. What this means for marketers: If your business model is such that it requires leaving the house, think about how you can model it as a place of comfort and safety—and where consumers can get something they can’t get at home. Faces high standards of success. Along with physical security, Gen Z has grown up in a world where financial security seems more like a luxury than a promise. Rather than relying on a company or higher-ranking individual to ensure their success, many Gen Zers are taking things into their own hands, opting to start their own businesses or capitalize on several talents by freelancing multiple jobs at once. Framing a marketing message to offer assistance to Gen Zers in these endeavors now proves a smart option. Is health-conscious. This one’s pretty straightforward: Gen Z cares more about their health than its older counterparts. This comes with society’s overall realization that fruits and veggies should be included in school lunches rather than sugary snacks and sodas—and the resulting changes that have been made as a result. Gen Z is even less likely to smoke cigarettes or drink alcohol compared to previous generations—especially with the ability to socialize from afar. So when it comes to advertising inexpensive, fried foods to teens out for a Friday night post-party drive—the net may not catch as many fish as it used to. Is more accepting of one another. Gen Z takes an attitude that already permeated the majority of millennials to an even higher height—the idea that gay, straight, black, white or anything in between, you’re a person on an even playing field with everyone else. For many in Generation Z, thinking about a day when gay marriage was illegal will seem antiquated and distant. Gen Z itself also comprises a diverse and multiracial group. That being said, members of Gen Z want to see brands that uphold similar values—and ones that give them the opportunity to support their fellow humans. When it comes to the rise of Gen Z as consumers, marketers must take these defining traits into consideration in order to successfully appeal to the people who will soon comprise the majority of the country’s purchasing power. Need help crafting your next marketing message? McNutt & Partners is a full-service advertising and digital marketing agency. Contact us today for your marketing needs! Call 334-521-1010, or visit our contact page. Social media is one of the most significant—and inexpensive—ways to cultivate a brand following. As a marketer, you should consistently be looking for ways to boost your social media following, but the turn of the season—in this case, the transition from summer to fall—is a good benchmark to make some extra effort. While success on social media isn’t always about the number of people following your page, having a high number of qualified leads certainly does help. Take these ideas into consideration if you feel the need to give your pages a push in the right direction this fall. Get creative with Halloween on the horizon. Halloween will be here before you know it, which offers a plethora of opportunities to have some fun with your social media followers in an effort to attract a larger audience. For example, ask your followers to post their favorite scary movies, and then compile a list of the “top 10” later in the month. Or, when it’s closer to the holiday, ask your social media audience to post a picture of their Halloween costumes to be entered to win a prize. Host giveaways for seasonal items. Along the lines of winning, social media giveaways are always a powerful way to boost your social media following. Think seasonal items like grills, football tickets, cool weather attire, home decorations, or fall yard equipment, etc. for prizes. With your followers happy for the chance to win free stuff, and your social media account happy for exposure due to said free stuff, it’s a win-win situation. Don’t forget football. While we’re talking about football, remember that it’s a huge part of fall culture. Stay in tune with your local football schedules, and play off of big games in your social media posts. Celebrate the big game that week with a giveaway or special offer solely for social media followers. You can also ask social users to correctly predict the score of that week’s game in exchange for a prize. Use gift-giving holidays to your advantage. Fall into winter is typically the most lucrative time of the year for retail and service-based businesses as consumers snag holiday gifts for friends and loved ones. Plan strategically in anticipation of holidays like Hanukah and Christmas to better your social media content. Create holiday-themed social media specials—offers that can only be redeemed if you show the social media post in person. This gives social media users incentive to continue to follow your page. You can also use spins like “A Gift for Me, A Gift for You,”—a buy one get one free deal for consumers to get a little something for themselves as they do their holiday shopping. Change your decorations for the fall season. In terms of your social media page, by “decorations” we mean your cover photos and profile pictures. Regularly changing at least your cover imagery will benefit your social pages by maintaining followers’ interest with new and fresh content. Have a new product or store display? Post it as your cover photo. Want to incorporate some fall colors? Make the appearance of your social media pages reflect the season. Double check your links. This is one tip that isn’t necessarily unique to fall, but is something you should do on a consistent basis. Regularly checking to make sure that all links to your social media accounts are going to the right places is important to ensuring that you never interrupt traffic to your social pages. Check your website, email signature and any other places that you link to your social pages to make sure they are working correctly. Give your posts a literal boost. Despite your best abilities to push out appealing content, sometimes your social posts need a little financial backing. Boost your social media following by paying to sponsor posts, which will in turn show them to a higher number of social followers than if you let the post grow organically. Take advantage of the change in seasons to incite positive change among your brand’s social efforts. Use these tips to boost your social media following to put more eyes on the shareworthy things your business is doing. Need help pushing your social media pages in the right direction? The McNutt & Partners team can help. Give us a call at 334-521-1010, or visit our contact page.